A beautiful home in Joseph. Considering the size, I am amazed at how well you handle the detail of the railings and clapboard. Also love the red roof. Don, you are outdoing yourself with these lilac paintings. I am enjoying having our lilac season extended by your paintings. I can almost smell their heady scent! 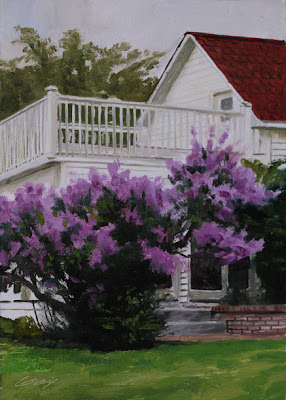 These Lilac paintings are inspired! Thank you, Perry. I enjoy your work. Lynne, you're very kind--thanks. I was surprised and pleased to find the lilacs still in bloom when I went to Wallowa County. Hi Katherine--I appreciate that, thank you.